You obtain these by obliterating current Season PvP gear at the Obliterum Forge in Dalaran. If you obliterate items marked Elite, you get Ecos da Dominação instead. Old items from previous seasons can not be obliterated. You should be able to obliterate everything named after the current season, including jewelry and relics. This includes items you get from world quests, as long as they are marked with the current season. You get 15 Ecos da Batalha per "Gladiator" item obliterted and 1 Ecos da Batalha per "Combatant" item obliterated. Note that relics are an exception to this and will always yield 1 Ecos da Batalha regardless of source. You can turn in 75 Ecos da Batalha for a Gladiator armor token of your choice (for example Elmo do Gladiador Bravio) to Marechal Eufrásio in Greyfang Enclave (Alliance) or Violeta Cose-sombras in Windrunner’s Sanctuary (Horde) in Dalaran. There are no tokens available for jewelry, relics or trinkets; only armor pieces. The main purpose of this currency is to help you collect the full appearance set, not necessarily to gear you up. I obliterated some gear and got 80 of these, i got the head item. It is a 870 ilvl haste / versatility / avoidance stat version. I am a fury warrior, so i am not thrilled(would rather have had mastery / crit for those are my prio stats). Picking gear based on stats i always prefered better, this is going to be one random drop adventure. If you happen to get a Cruel Gladiator gear from your Relinquished Tokens (like Braçadeiras Abdicadas from Nethershards), you can Obliterate those for 10x Echoes of Battle as well. Is there a faster way to get about 675 of these? Because that's the total cost to get a full PvP set from a vendor. Does anyone know whether you lose the appearance of gladiator items that you obliterate? can someone mention the irony in obliterating 880 gear (up to 8 piece for 75 echoes) simply for another piece of 880 gear. Is there any point in keeping these for next season? I already have all set and all my items are well above ilvl 880. Should I just spend them in the hopes of a titanforge? Combatant gear can now be obliterated as well, giving 1 Echo each. Overall should be easier to get your sets from tokens than before. hi um i was just wondering if these echos of battle resets and dissaprd i had like 70 of them but now they are gone....is it a reset or a bug i have to Contact blizzard for this? So since they "refund" your echoes. Sounds like you should just hoard your gear and only obliterate it when you have enough for a piece. I thought this currency was to help with bag space. Season 4 (Ferocious) gear bought with 100 of these has a base ilvl of 895 and can warforge/titanforge. Here's a pic of bracers I just bought: http://i.imgur.com/PWXlpB4.png My paladin got a 900 piece out of it. These seem to have fixed stats for each item token, for example I have bought 4 chests on my warrior and every single one had crit mast with heavy on the crit, and every pair of bracers I have bought have had hast verstat with heavy versat, I have not seen anyone else comment about this but I have bought a crap load of tokens this season and have not got a single piece of gear with different stats from the same type of token. So if you are fishing for stats you want but already have a piece of the gear you can get from them don't bother, you can only hope to get titan forged of the same stats at that point. If anyone has gotten different stats from 2 token items, (not from world quests, those DO have randomized stats) I would love to know, other wise I will no longer be wasting my time with these and would recommend you all do the same outside of getting the mogs. Turns out I was wrong, I bought 2 more before 7.3 hit, both being chest items and both having different stats. So I guess the ones I bought before I just got really unlucky getting the same stats over and over again. 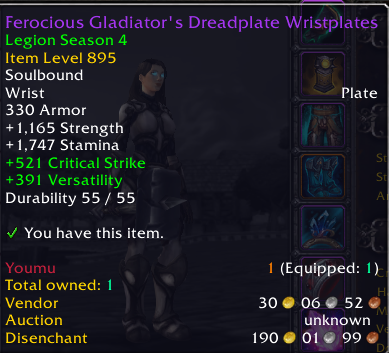 Based on my experience, you specifically need item to be 890 ilvl, I obliterated 915-920 (titanforged) gladiator gear and got 1 echoes of battle. Is it possible to obliterate new expansion gear whilst it is a current season and still get Echoes of Battle in Battle for Azeroth though? Is this currency still obtainable at level 111+ up to level 120 or is it just specifically for level 110? I need to know how to get echoes of battle at this time. I can't believe that all the times I've asked while in the game, not one person knows. Isn't there anyone else in the entire world who still needs these other than me? This is so frustrating that there's nowhere at all that has an answer. Usados para adquirir poderosas armaduras de JxJ. No fim da temporada, esta moeda é convertida em ouro.